Due to its healthy economy and effective management of its resources, Canada has a variety of jobs available. Due to its healthy economy and effective management of its resources, Canada has a variety of jobs available. Though there are many jobs available out there, you are still required to attend and pass an interview. In the ever-competitive world where time is of the essence, more and more organisations are using video resources such as Skype and Google Hangouts, not only to conduct meetings but also host job interviews. It is time saving and allows them to interview more candidates than a regular face to face interview. Unlike a normal face to face interview, video job interviews have their own etiquette and presentation and one has to prepare to be on camera. Here are eight important suggestions to help you impress a potential employer in front of the camera. It is important to make sure that you are as comfortable as possible. Choose a device that you are at ease with, whether it is a laptop, tablet or even a smartphone. Also, make sure that you get the little details right including your positioning and lighting of the room. If unsure, it is advisable to run through a few mock interviews to make sure everything is in perfect order to give you the best possible chance of success in the interview. To avoid any unnecessary technical faults, it is best to set up your device in advance and also make sure to end the call when the interview is over. Ensure that your face is in line with the camera of the device as you will need to maintain eye contact at all times during the interview. Video interviews can be tricky and it is very easy to lose focus or get distracted so make sure that you look directly into the camera and not the screen as you talk. It is important that you are cool, calm, and collected and your setting should be clean and well organised. Avoid any distractions and if you are sitting in an open area make sure that there is no movement around. Typing during the interview can be lead to distractions so it is better to have a pen and paper on hand to take notes. A bright room with good lighting is more important than many people realise, you can also test the setup with someone before the interview to make sure everything is in the best position to boost your chances of success. Set up enough lights in front of you to make sure your face looks bright, also put extra lights behind where you sit to make sure there are no reflections or dark shadows behind your head. It is important to dress up like you will be doing a face to face interview. Dress appropriately and professionally from head to toe, wear formal clothes or suits with dark colours and avoid designs and patterns that appear too stylish, keep it simple. Also, minimise accessories like jewellery, have a natural look that is in line with organisational culture. Speak in a firm, friendly voice and be as clearly and audibly as you would in a face to face conversation. It is important to keep in mind that you will need to get it right in a video interview, both in how you look and talk. 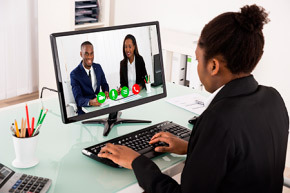 Video interviews can be tricky in that there is sometimes a slight time gap because of online connections, so it is important to be attentive and listen carefully without talking over the interviewer. Wait until you are sure they have stopped talking, and where you don’t understand, politely ask them to repeat or rephrase the question or comment. Not many people find it easy to be iasiann front of a camera and for first timers, it can be an overwhelming experience, so you must be relaxed and calm. If it is a group interview, make sure you focus and pay attention to the person who is interviewing you.In case you find yourself overwhelmed and experiencing a case of nerves don’t hesitate to ask for a short break to collect and compose yourself. It is fine if you slip up, don’t let one mistake put you off. In case you started off responding to an interview question and would like to correct yourself, please do so and rephrase your answer. They will appreciate your honesty and willingness to admit your error, it will score you valuable points. Lastly, make sure you are well researched and practice as often as possible, being on camera requires enough practice.